Ivanka Trump arrived in India on early Tuesday morning and arrived in the GES venue at Hyderabad International Conventional Center around 3.15 p.m. The adviser and daughter of the US President Donald Trump, Ivanka Trump is in India leading the US delegation for the eighth edition of the Global Entrepreneurship Summit. The first daughter will be in Hyderabad for the three-day-long event and the city is welcoming Trump with open arms. As a part of this, Bangles-makers in Hyderabad has specially designed Ivanka bangles and want to gift them to Donald Trump’s daughter. The shopkeepers in the Charminar area have bangles with Trump’s name and US-India flags, News 18 reported. The theme of the colorful bangles from famous Laad Bazaar or Choodi bazaar is ‘US-India friendship’. “We heard Ivanka Trump along with PM Narendra Modi will visit the city. 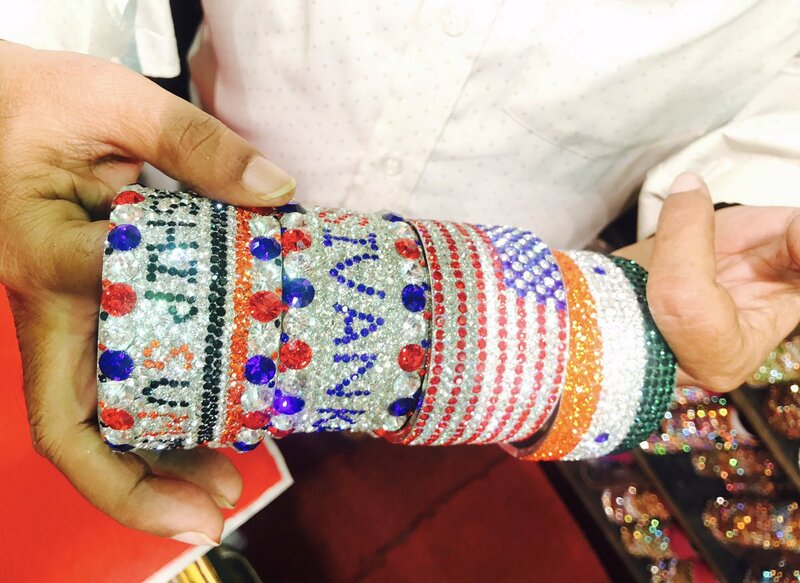 We especially made these bangles to give them as a gift to Ivanka Trump,” News 18 quoted Mohammad Anwar of Khaja Bangle Store, who created these bangles. “It took us 45 days to make these bangles. We hope we can present them to her,” he added. Laad Bazaar or Choodi Bazaar is a very old market popular for bangles, semi-precious stones, pearls, and jewelry located in Hyderabad and it is situated on one of the four main roads that branch out from historic Charminar. It is in operation since the time of the Qutb Shahis and the Nizams. Ivanka Trump arrived in India on early Tuesday morning and arrived in the GES venue at Hyderabad International Conventional Center around 3.15 p.m. She is expected to visit the historic Golconda Fort on Wednesday. Reports suggest that her shopping plans at Laad Bazaar and Charminar visit were dropped due to security concerns.